Fox has renewed the critically acclaimed hit drama 9-1-1, from creators Ryan Murphy, Brad Falchuk and Tim Minear, for a second season, it was announced today by Gary Newman and Dana Walden, Chairmen & CEOs, Fox Television Group. Said Walden and Newman. "With a bold concept, award-winning stars and a flawless execution, Ryan, Brad and Tim have done it again. They have tapped into the cultural zeitgeist and reimagined the procedural as only they could, bringing it to life with a dream team of actors led by Angela, Peter and Connie. This is storytelling at its best and we're so pleased that it's resonated with our audience. We'd like to thank everyone involved with this production for their stellar work, and we look forward to another thrilling season of 9-1-1." The series premiere of 9-1-1 has grown to more than 15 million viewers in seven-day multi-platform viewing, including its encore, delivering Fox's largest debut since Empire in 2015, excluding post-Super Bowl premieres. In Nielsen Live + 7 Day, the show delivered 10.7 million viewers, a lift of 57% from Live+Same Day. 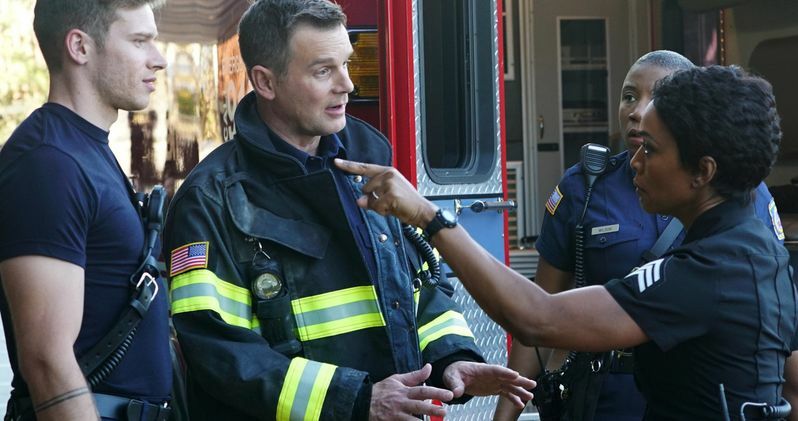 9-1-1 ranks as the highest-rated debut since The Good Doctor and the week's No. 1 drama among all key demos, averaging a 3.0/11 L7 in Adults 18-49, up +67% from L+SD, according to Nielsen. It also ranks as the highest-rated Wednesday series premiere on television in more than a year. The first hit series of 2018, 9-1-1 improved its fall time period average by 36% in the demo and +47% among Total Viewers. On social media, 9-1-1 is this season's No. 1 new broadcast drama series and the most engaging new broadcast program on YouTube, with more than nine million views. In week two, 9-1-1 delivered a three-day multi-platform audience of 11.6 million viewers, including its encore. Among Adults 18-49, it posted a 2.5/9 L3 rating, up +67% vs. L+SD, tying Modern Family as the night's No. 1 program for the second consecutive week, while also winning the 9:00-10:00 PM hour. 9-1-1 explores the high-pressure experiences of police officers, firefighters and emergency operators who are thrust into the most frightening, shocking and heart-stopping situations. These first responders must try to balance saving those who are at their most vulnerable with solving the problems in their own lives. The procedural drama stars Academy and Emmy Award nominee Angela Bassett (American Horror Story, What's Love Got to Do with It), Emmy Award and Golden Globe nominee Peter Krause (The Catch, Six Feet Under) and Emmy Award nominee Connie Britton (Nashville, Friday Night Lights, American Horror Story). The series also stars Oliver Stark (Into The Badlands), Aisha Hinds (Shots Fired, Underground), Kenneth Choi (The People v. O.J. Simpson: American Crime Story) and Rockmond Dunbar (Prison Break, The Path). In the all-new Next Of Kin episode of 9-1-1 airing tomorrow, Wednesday, Jan. 17 (9:00-10:00 PM ET/PT), on Fox, Bobby (Krause) and his team respond to an emergency at a children's birthday party that leaves lives hanging in the balance. The crew jumps into action after one of their own is involved in a devastating accident. Athena (Bassett) tries to cope with a tragedy that hits way too close to home, and Abby (Britton) is confronted with a life-changing decision for her mother and makes a connection with Buck (Stark). 9-1-1 is produced by 20th Century Fox Television in association with Ryan Murphy Television and Brad Falchuk Teley-Vision. Ryan Murphy, Brad Falchuk and Tim Minear are creators, executive producers and writers on the series. Bradley Buecker is an executive producer and directed the series premiere. Alexis Martin Woodall and Angela Bassett serve as executive producers.